Posted on: May 24th, 2016	by Jennifer A. This post was made possible by Visit Fred, Fredericksburg, Virginia’s tourism office who arranged our family media trip to the area. 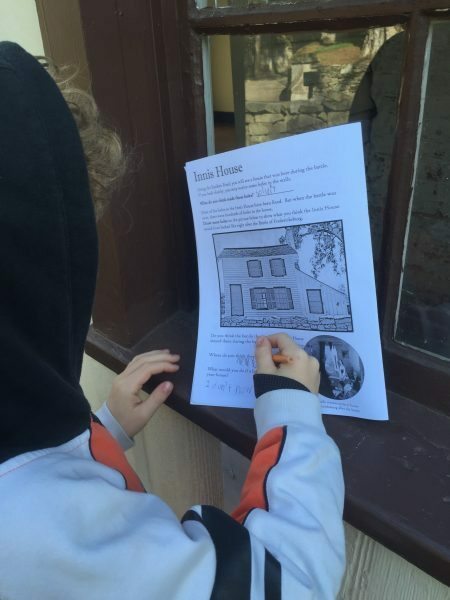 We appreciate their support of Jersey Family Fun that allows us to share with families information about Fredericksburg attractions we think our readers will enjoy. When the Fredericksburg Battlefield Visitor Center caught my attention from our Trolley Tour of Fredericksburg, I really had no idea how large the Fredericksburg Battlefield was or how much history there was on this property, but I was intrigued enough that I wanted to visit. 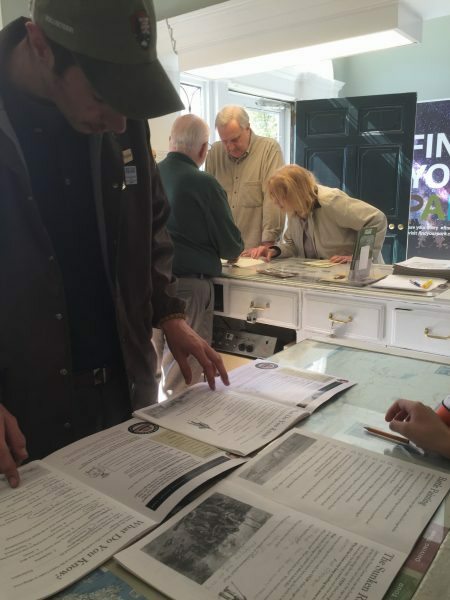 I’m so glad I did because beyond the various exhibits and a 20-minute film, visitors can take a self-guided tour down the Sunken Road and walk through the national cemetery, where 15,300 Union soldiers are buried. 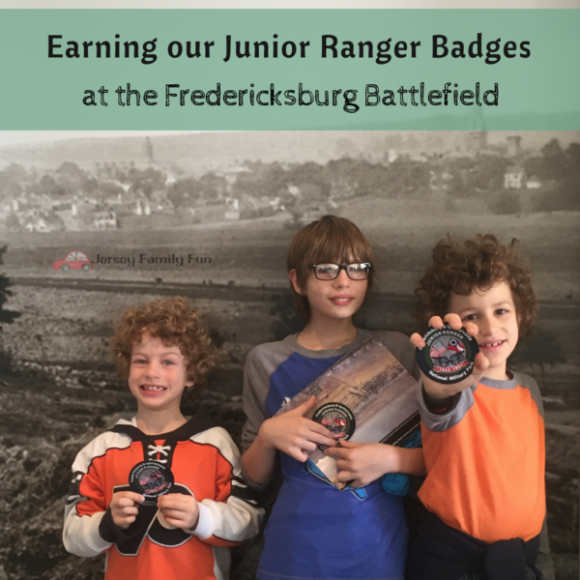 If that wasn’t enough, visiting the Fredericksburg Battlefield meant we were visiting our first National Park… and the Fredericksburg & Spotsylvania National Military Park participates in the Junior Ranger badge program. 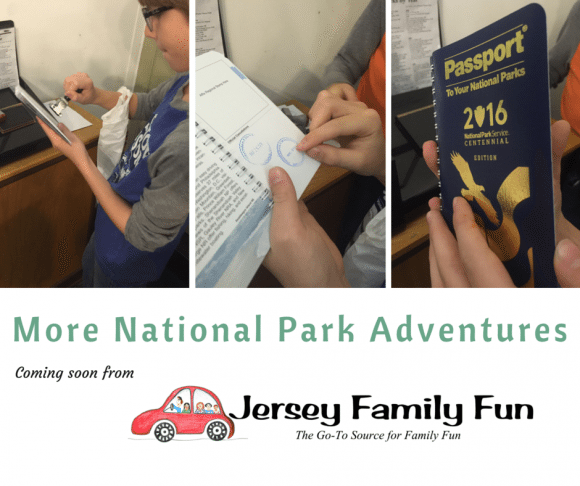 It was a trip filled with firsts… first battlefield, first National Park, and first Junior Ranger badges. In fact, with the Take a Kid to a Park program we all were admitted free since my 10 year old is a 4th grader. Here’s how the Junior Ranger Badge program works. When you visit a participating location, ask for information about the program for that location and get whatever materials you need. Typically, there is a workbook that needs to be completed. Learning about the Fredericksburg trail and completing the Junior Ranger badge requirements. 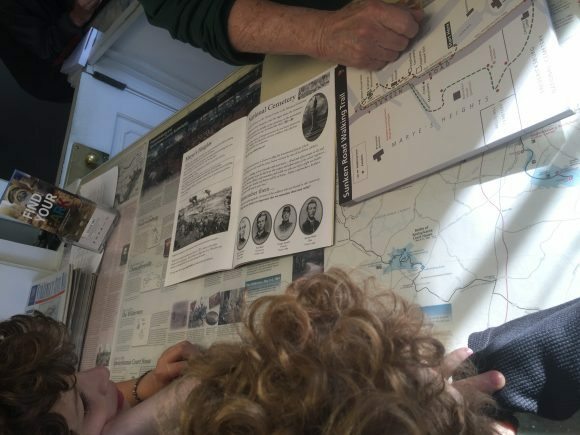 For the Fredericksburg Junior Ranger badge, each workbook page corresponded to a different structure, monument, or building along the paved path of the Fredericksburg & Spotsylvania National Military Park trail. On some pages, we had to complete questions. On other pages, we made predictions or drew pictures. Some just asked us to imagine what it must have been like to be in Fredericksburg while the Civil War was happening. After we completed the trail and the workbook, my boys shared their work and what they learned with a National Park Ranger and received their Junior Ranger badges. This special badge has a center circle with rings around it for additional locations and badge work. Surprisingly, I enjoyed learning about history. While I am not a history buff by any means, I do love the outdoors. The Fredericksburg & Spotsylvania National Military Park signage and exhibits did a fabulous job of helping me wrap my mind around a part of history while being active outside. Just like my kids, I could imagine the soldiers on both sides of the stone wall and cannon balls flying through the air. I will remember the stories of soldiers and residents who made unique sacrifices during the Civil War. Another wonderful surprise for me, was how much my oldest son (11 years old) enjoyed visiting a National Park. He wanted to share his thoughts in this blog post. You can learn a lot just by walking through a trail in history. Fredericksburg Battlegrounds is one of these places. 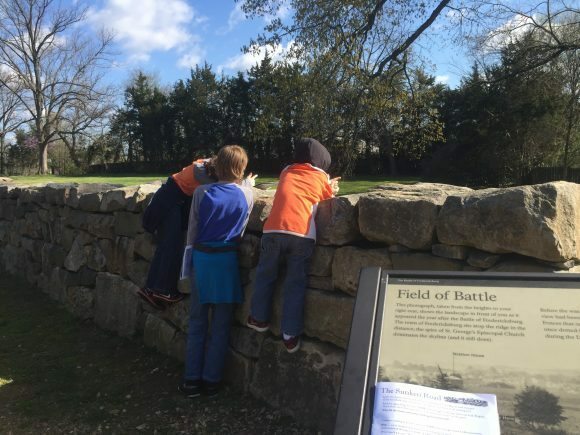 At the battlegrounds at Fredericksburg there was a war like no other. While right now it looks empty, over 150 years ago it was the site of a Civil War battle in which over 150,000 died. Let me tell you about my trip through history. The inside of buildings plays a very important role to figuring out what happened here 150 years ago. Inside there is a video on what happened in the town of Fredericksburg during the war. Then there is a cannonball in a wall so people could learn how much damage was done. Overall the inside gives a lot for a person to learn. Even though the inside was cool, it was nothing compared to the outside. 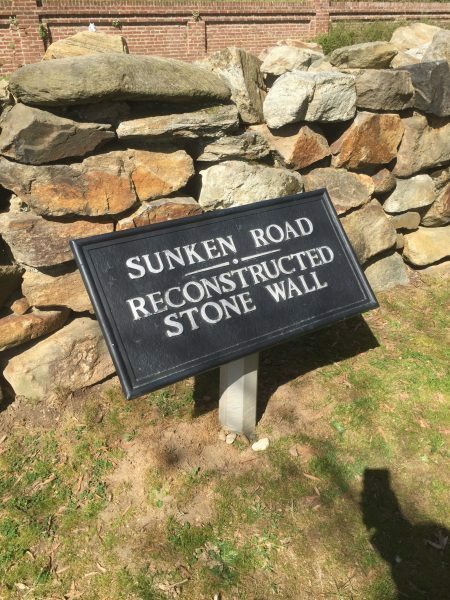 The outside had the actual Sunken Road used in the Civil War, A big pathway to the graveyard and a memorial dedicated to a man important to the war. Even more exciting there was a chance to become Junior Rangers for battlegrounds. All we had to do was fill out a workbook about the Civil War. Maybe you will become one too. All this and so much more. All of these reasons are why you should go to Fredericksburg battlegrounds. With reasons like these, Why should you not go? Incredible, right? He was so inspired by the Fredericksburg & Spotsylvania National Military Park he had to write about it. In the gift shop, he even insisted I get him a National Parks book and stickers (see below). He eagerly wants to visit more National Parks, earn more badges, and collect stickers. We hope you’ll keep following our National Park adventures. There’s sure to be more to come. 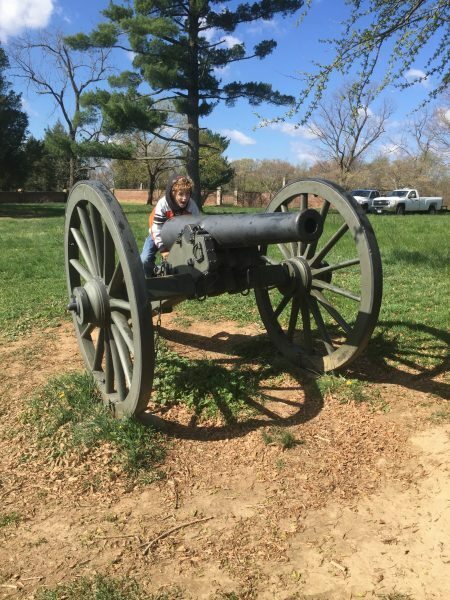 Find more of our Fredericksburg & Spotsylvania National Military Park pictures in our Facebook Gallery. Learn more about this and other Frederickburg attractions at the Visit Fred’s site the best source to learn and plan for your family vacation to Fredericksburg, Virginia. 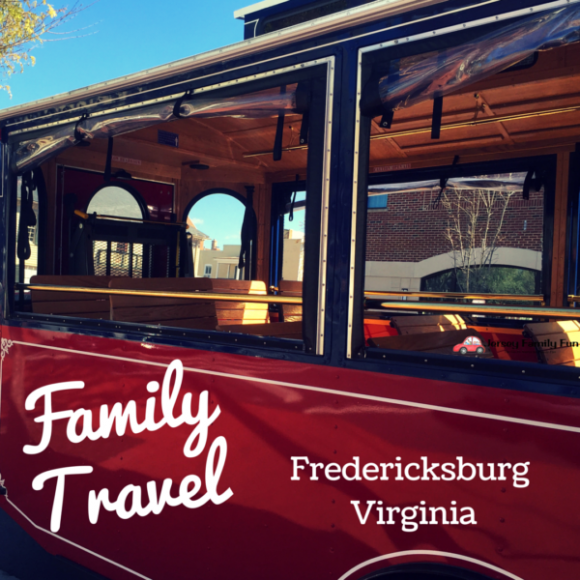 Click over to see the rest of our Family Travel to Fredericksburg, Virginia series. 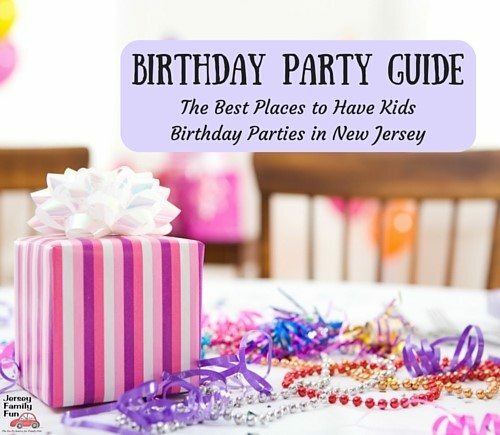 To arrange a feature on your location contact Jennifer Auer, Jersey Family Fun editor & publisher at jenniferauer@jerseyfamilyfun.com. This post was made possible by Visit Fred, Fredericksburg, Virginia’s tourism office who arranged complimentary admission for us at many Fredericksburg attractions. All of our opinions are our own based on our experiences.